Went tracking at a local park with a couple of friends this weekend. One of them has spent quite a bit of time there and showed us several really cool things including several black bear beds/dens. 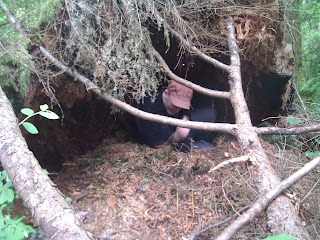 Here's Mark enjoying a cushy den built under a nice sheltered overhang. 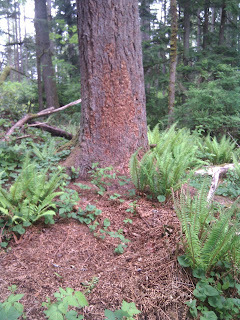 And here is a nice bed with a thick layer of sword ferns. So cozy. Note as well the marking on the tree behind the bed.